Thomas Daniell and his nephew William arrived in Calcutta in 1786 and spent the following nine years travelling through virtually unknown parts of India observing and recording with skill and accuracy the diverse scenery and architecture they encountered. William kept a journal which along with the notes inscribed on their drawings and paintings provided a thorough record of this strange and beautiful country for an eager western audience. 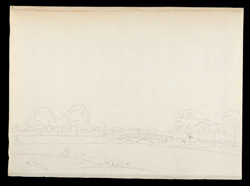 This is one of several drawings made during a tour in south and western India during 1792-93. Chennai (Madras) lies on the Bay of Bengal in the north-east corner of Tamil Nadu. It was founded in 1639 when Francis Day of the East India Company acquired land for a warehouse or ‘factory’ which was completed on 23 April 1640. The fort was constructed on the seafront in the early 1640s as the Company’s headquarters on the Coromandel Coast. It was initially a trading post and base for European residents, becoming the home of the Presidency government and one of India’s major ports and mercantile centres.